The program asked for a building with library, training rooms, an administration and an auditorium on a sole building. The proposal fragmented the program in three groups: The library, the training rooms, and the auditorium; then it joined them with a platform on the first floor that allows flexibility but at the same time autonomy of different activities. This platform helped improve public participation as you can easily see the many options you have when you enter the building. The city is located in the north of Los Andes mountain ridge, in a deep valley sorrounded by steep topography. This geography defines the identity and the image of the city. The project aims to interpret this identity, it intends to integrate itself into the landscape by becoming pat of it. 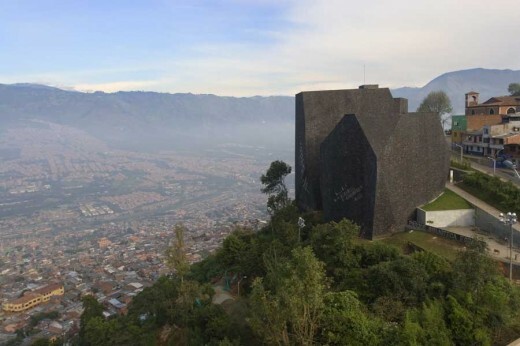 Much more than a building, the project proposes the construction of a topography that belongs to the valley. 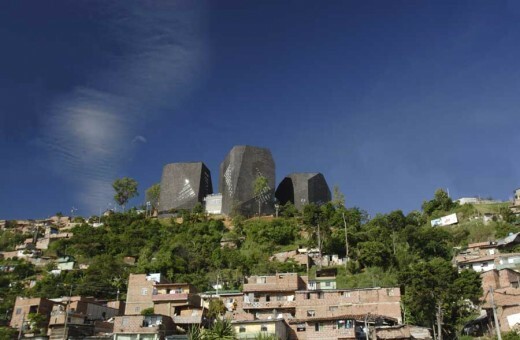 It is a mechanism of organization of the program and the whole of its sorroundings, showing the unknown directions of the irregular mountain contours, not like a metaphor, but like an organization of form in the site, a folded building cut like the mountains that sorround it. An artificial landscape that redefines the folded mountain structure in form and space, nullifying the idea of landscape as background and encouraging the ambiguity building-landscape. 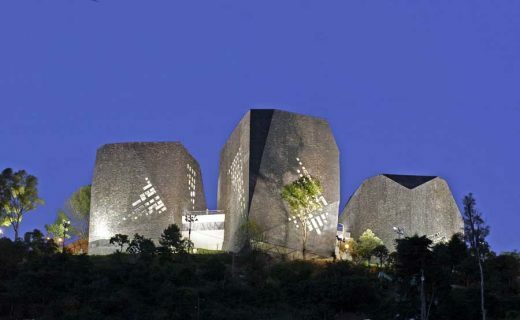 The Project is organized in two structures: the first one is the building – landscape (rocks) and the second one is a platform that integrates and transforms the covered space into a square that looks into the valley; this way, the building is empowered as a meeting place, multiplying the connections and letting it develop as a reference point. The site is composed by small brick houses, product of auto construction; and residue of green areas as a result of the impossibility to construct on it. This organizational system produces a uniform texture of the city and defines its landscape. Like an icon, the building keeps the tension that already exists. Geography becomes the element of hierarchy; and architecture as the epitome of texture. The Project is noticeable from a big part of the city, allowing it to define itself as the symbol of a new Medellín, as a way of making people feel identified and embrace the building as their own. In its present state, the building is one of the touristic attractions in the city and one of the most visited by tourists and locals alike. In addition to make the an icon, the first premise was to develop a biulding that, through its interior design, could de-contextualize the individual from the poverty that sorrounds him creating a warm atmosphere based on natural light, generating a great ambient for study and lecture. This is the reason why the building takes a timid look into the city trough the small windows that show the relation with the valley, letting light enter from the top of the building. 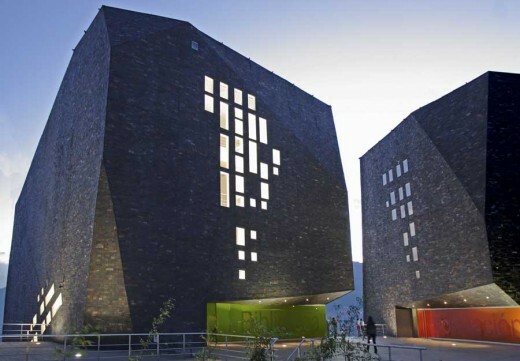 Architect: GIANCARLO MAZZANTI & Arquitectos Ltda.